Greenberg Research Fund at New York University School of Law. ...... (unpublished document on file as part of the Papers of Thurgood Marshall in Library of. Thirty Years of Solicitude: Antitrust. Law and Physician Cartels. Thomas (Tim) Greaney, J.D.*. For over thirty years the United States Department of Justice. An International Common Law of. Antitrust. Spencer Weber Waller*. I. INTRODUCTION. There is a broad conflict over the direction of future progress in interna-. University of Baltimore. Legal Studies Research Paper No. 2009-17. 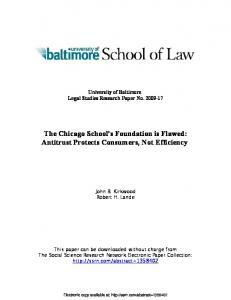 The Chicago School's Foundation is Flawed: Antitrust Protects Consumers, Not Efficiency. www.ftc.gov/speeches/rosch/090325abaspring.pdf. 5 See Frank H. Easterbrook, The Limits of Antitrust, 63 TEX. L. REV. 1 (1984); see also Geoffrey A. Manne &. 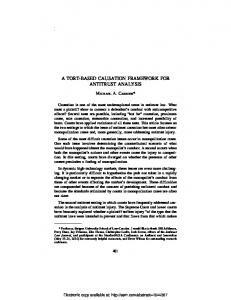 Causation is one of the most underexplored areas in antitrust law. What must a plaintiff show to connect a defendant's conduct with anticompetitive effects? Electronic copy available at: http://ssrn.com/abstract=1287221. Regulatory Gaming Dogan & Lemley. DRAFT. Antitrust Law and Regulatory Gaming1. Stacey L.
www.competitionpolicyinternational.com Competition Policy International, Inc. 2010© Copying, reprinting, or distributing this article is forbidden by anyone other than the publisher or author. Antitrust 2025 Maurice Stucke 1 I. INTRODUCTION Antitrust policy in the United States has roughly twenty to thirty year cycles: (i) after initial dormancy,2 1900—1920, the promise of antitrust; (ii) 1920s—mid-1930s, antitrust dormancy in the boom and bust years; (iii) mid-1940s—1970s, antitrust representing “the Magna Carta of free enterprise”3 in preserving economic and political freedom; and (iv) late-1970s— 2010, antitrust’s contraction under the Chicago and post-Chicago Schools’ neoclassical economic theories. So if past cycles are reliable indicators of future ones, we are at (or approaching) a new antitrust policy cycle, with 2025 being the approximate midpoint. Any new policy cycle will be defined by three fundamental questions: a. What is competition? b. What are the goals of competition law? c. What should be the legal standards to promote these goals? One reason the Chicago School was effective in displacing the existing paradigm was its answering these three questions. For example, in The Antitrust Paradox, Robert Bork first looked at several different definitions of competition. Rejecting competition as rivalry, perfect competition (“utterly useless as a goal of law”), and protection of fragmented markets, Bork settled on his definition of competition, namely as a shorthand expression of consumer welfare, which comported with his goal of competition law.4 Bork then outlined the legal standards to promote his conception of consumer welfare. Consequently, the first and second questions are fundamental, as “[e]verything else follows from the answer we give.”5 Rather than predict the state of antitrust policy in 2025 (such as more or less cartel enforcement), this Essay will map two scenarios based on these three fundamental questions. At a 2010 American Antitrust Institute conference, a distinction was made between prediction and futures planning.6 Prediction is something fairly precise and usually anticipated within a short time period. Futures planning is less precise. It is an open creative exercise in developing multiple 1 Fulbright Lecturer, China University of Political Science and Law; Associate Professor, University of Tennessee College of Law; Senior Fellow, American Antitrust Institute. The author wishes to thank Kenneth Davidson, Phil Evans, Albert Foer, John Holmes, Thomas Horton, Robert Steiner and Spencer Weber Waller for their helpful comments. 2 U.S. Dep’t of Justice, Antitrust Div., Timeline of Antitrust Enforcement Highlights at the Department of Justice, http://www.justice.gov/atr/timeline.htm#cases (noting that on “average, less than 2 cases filed per year; antitrust enforcement not specifically funded”). 3 United States v. Topco Associates, Inc., 405 U.S. 596, 610 (1972). 4 ROBERT H. BORK, THE ANTITRUST PARADOX: A POLICY AT WAR WITH ITSELF 57-61 (1993). 5 Id. at 50. 6 Prediction and Antitrust Invitational Symposium (June 23, 2010), http://www.antitrustinstitute.org/content/prediction-and-antitrust-invitational-symposium. Relaxing the assumption of the relative rationality of the government raises additional concerns about the proper antitrust policies. 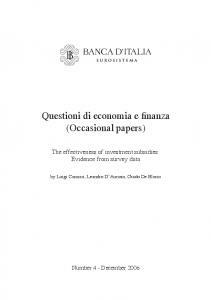 For example, under Scenario IV, both firms and consumers are bounded rational. Competition can be viewed as an evolutionary trial-and-error discovery process. Bounded rational firms have limited, imperfect knowledge about current and future preferences of 7 U.S. Dep’t of Justice & Fed. Trade Comm’n, Horizontal Merger Guidelines (2010). Non-price competition in the 1992 Merger Guidelines was relegated to a footnote: “Sellers with market power also may lessen competition on dimensions other than price, such as product quality, service, or innovation.” 8 See, e.g., J. Thomas Rosch, Comm’r, Fed. Trade Comm’n, The Next Challenges for Antitrust Economists (July 8, 2010), http://www.ftc.gov/speeches/rosch/100708neraspeech.pdf. 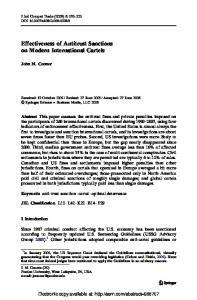 9 Maurice E. Stucke, Reconsidering Competition, University of Tennessee Legal Studies Research Paper No. 123, available at http://ssrn.com/abstract=1646151. bounded rational consumers. While starting out as bounded rational, market participants, based on situational factors, can become more (or less) rational. Thus firms compete in offering products and services to continually satisfy consumers’ changing preferences. Firms try different solutions and can learn from the customers’ feedback (or their competitors’ experience) which products and technological solutions are superior. In the United States today, the Chicago, post-Chicago, and to the extent distinguishable Harvard Schools of competition policy confine their analysis to Scenario I where firms and consumers are rational, as defined under neoclassical economic theory. Consequently, one possibility is that antitrust policymakers by 2025 will be analyzing competition under the frontiers of Scenarios II, III, and IV. In doing so, the conception of competition will broaden beyond the current Guidelines’ focus on static competition in narrowly defined markets. Issues of systemic risk, behavioral exploitation, herding behavior, and overconfidence bias will increase in importance. Antitrust analysis will shift from narrowly defined markets to vertical and horizontal competition among larger units, systems, platforms, and alliances in which potential competition plays an important analytical role. As policymakers analyze competition under the frontiers of Scenarios II, III, and IV, neoclassical microeconomic analysis will continue to play a role, albeit a smaller one. If a better default conception of competition does not emerge, antitrust enforcers will continue using Scenario I’s neoclassical economic theories as the starting point for their analysis. In a world of rational profit-maximizers with perfect willpower, what would one expect? Thus, Scenario I competition could represent the anchor from which enforcers deviate as far as the evidence and law permit. Alternatively, by 2025, the prevailing theories of competition could shift to a new default. For example, based on the empirical findings or legislative command, Scenario II (rational firms/bounded rational consumers/rational or bounded rational government) or Scenario IV (bounded rational firms, consumers, and government) could become the new default conception of competition. Under Scenario II, behavioral exploitation and consumer protection will play a greater role in competition policy. Under Scenario IV, competition officials will focus more on such factors as systemic risk, path dependency, the importance of maintaining trial-and-error feedback loops, consumer choice, and competitive diversity. So how far will policymakers depart from Scenario I’s conception of competition premised on rational firms and consumers? 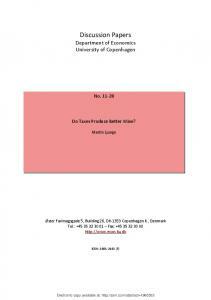 This depends on the developments of the interdisciplinary antitrust scholarship and policymakers’ incentives. We are already seeing this push in the antitrust scholarship. Professor Spencer Weber Waller, for example, in his recent work is incorporating insights from corporate governance, strategic management, and marketing to shape antitrust analysis.10 Professor Thomas Horton’s recent article further expands an evolutionary economic theory of competition law.11 And the behavioral antitrust scholarship over 10 Spencer Weber Waller, Corporate Governance and Competition Policy (Sept. 23, 2010), http://ssrn.com/abstract=1681673; Deven R. Desai & Spencer Weber Waller, Brands, Competition and the Law (Feb. 1, 2010), http://ssrn.com/abstract=1545893. 11 Thomas J. Horton, The Coming Extinction of Homo Economicus and the Eclipse of the Chicago School of Antitrust: Applying Evolutionary Biology and Ethics to Structural and Behavioral Antitrust Analyses, LOY. U. CHI. L.J. (forthcoming 2011), available at http://works.bepress.com/thomas_horton/1. the past few years reexamines these fundamental questions, with interest in behavioral antitrust, both here and in Europe, growing.12 Thus it remains unlikely that by 2025 any unifying definition of competition will emerge. Instead, by 2025 policymakers may relax the current prevailing assumptions underlying their conceptions of competition. In doing so, they will encounter greater complexity. Competition by its nature will be increasingly viewed as an often unpredictable, dynamic process, not easily subject to mathematical modeling. Competition will be incompressible. It will be “impossible to account for the system in a manner that is less complex than the system itself.”13 III. WHAT ARE THE GOALS OF COMPETITION LAW? Between the mid-1940s and 1970s, antitrust policy recognized multiple political, social, and economic goals. The political and social goals were salient given the cartels in Nazi Germany and their collusion with U.S. firms.14 In the 1970s—2010 policy cycle, some antitrust scholars pursued a quest for a single unifying goal. Some began evangelizing the purity of competition law, free from non-economic objectives. 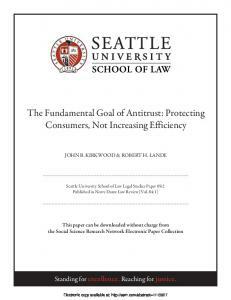 The debate devolved to whether the antitrust goal should be increasing total economic- or consumer welfare.15 So what will be the goals of competition policy in the next antitrust cycle? One scenario is that antitrust scholars and policymakers continue to debate over the proper economic welfare standard. But the debate over antitrust’s goals has narrowed to such a degree that further contraction is unlikely. Instead, any movement is likely to go in the opposite direction. Thus the second scenario is that over the next thirty years the goals of competition law will broaden to include political, social, and ethical concerns. Going forward, antitrust scholarship will increasingly emphasize the normative foundations of competition law.16 Competition will be increasingly viewed as a means to secure political, economic, and individual freedoms, which in turn can promote innovation and dynamic competition, as well as the good life. Several additional forces can shape these goals. First are the changes in the conception of competition by 2025. How one defines competition (say static price competition) will affect the resulting goals of competition 12 See, e.g., Amanda P. Reeves & Maurice E. Stucke, Behavioral Antitrust, 86 INDIANA L.J. (forthcoming 2011) (discussing increasing interest in behavioral economics and its applications to competition law), available at http://ssrn.com/abstract=1582720. 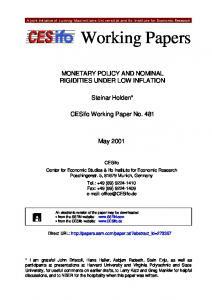 13 Organisation for Economic Co-operation and Development, A Framework to Measure the Progress of Societies: Statistics Directorate, Working Paper No 34, at 10 (July 12, 2010), available at http://www.politiquessociales.net/IMG/pdf/framework.pdf. 14 WENDELL BERGE, CARTELS: CHALLENGE TO A FREE WORLD (1944); Maurice E. Stucke, Should the Government Prosecute Monopolies?, 2009 U. ILL. L. REV. 497 (2009). 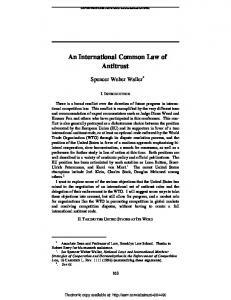 15 Rudolph J.R. Peritz, Foreward: Antitrust As Public Interest Law, 35 N.Y.L. SCH. L. REV. 767, 771-72 (1990) (observing how the traditional array of goals such as the abatement of unfair competition, a strong preference for individual entrepreneurs, the disfavor of monopoly profits, a distrust of firms with great economic power, and a recognition of competition as a process with social, economic, and political returns were shoved into the archives of antitrust history ). 16 For some recent examples of this scholarship, see, e.g., Darren Bush, Too Big to Bail: The Role of Antitrust in Distressed Industries, 77 ANTITRUST L.J. (forthcoming 2010); Frank Maier-Rigaud, On the Normative Foundations of Competition Law (forthcoming 2011 in the ASCOLA Competition Law series by Edward Elgar). To the extent the Beijing Consensus continues in its present form (a far from certain conclusion22) the next antitrust cycle might mark a competition between a “Democracy Consensus” and “Authoritarian Consensus,” where antitrust policy plays a key role. If the prevailing antitrust goal is to maximize productive and allocative efficiency, then China can claim the advantage. If the primary antitrust goals are lower prices and greater output, then China’s authoritarian government can claim that the rule of law, democracy, and individual freedoms are unnecessary to secure such aims. Instead, the United States and E.U., to differentiate their competition policies from an Authoritarian Consensus, would have to promote their comparative advantage. The primary aim of competition law, under the Democracy Consensus, is not to secure lower prices, but to prevent the formation of powerful firms and state-controlled enterprises that threaten a dynamic economy and democracy. The United States and E.U., consistent with a broader conception of competition, can emphasize the significance of economic, personal, and political freedoms, as important in themselves, as well as important in promoting dynamic efficiencies and the good life (as further developed under the happiness economic literature). So under the second scenario, these forces can converge into a powerful socio-politicaleconomic movement. The primary value of competition and competition policy will be to secure political, economic, and individual freedoms and prevent the concentration of political and economic power. IV. WHAT SHOULD BE THE LEGAL STANDARDS TO PROMOTE THESE GOALS? An inherent trade-off exists between antitrust goals and legal standards. One can use a fact-specific weighing standard, such as the rule of reason, if one has a narrow, clear antitrust objective. Alternatively, one can have multiple and conflicting policy objectives, if they are synthesized into clear rules that market participants can internalize and follow. One cannot have, consistent with the rule of law, a fact-specific weighing standard and multiple policy objectives. That is a recipe for disaster. Up until the late 1970s, antitrust policy promoted multiple economic, social, and political goals. Accordingly, between the mid-1940s—1970s, the U.S. Supreme Court generally (but not always) sought four things. First, it sought a legal standard that was administrable for generalist judges.23 With some exceptions, the Court turned to the legislative history or common law precedent as a basis for its standards.24 Second, the Court sought legal standards to enhance predictability. For example, in devising the thirty percent presumption for mergers, the Court sought to foster business autonomy: Unless business executives “can assess the legal consequences of a merger with some confidence, sound business planning is retarded.”25 The Court’s role was to provide clearer rules on what was civilly (and criminally) illegal under the Sherman Act. Third, the Court sought to prevent the lower courts from being bogged down in difficult economic 22 Yang Yao, The End of the Beijing Consensus, FOREIGN AFFAIRS, Feb. 2, 2010, available at http://www.foreignaffairs.com/articles/65947/the-end-of-the-beijing-consensus. 23 See, e.g., United States v. Phila. Nat l Bank, 374 U.S. 321, 362 (1963) (“in any case in which it is possible, without doing violence to the congressional objective embodied in . . . [the statute], to simplify the test of illegality, the courts ought to do so in the interest of sound and practical judicial administration”). 24 Maurice E. Stucke, Does the Rule of Reason Violate the Rule of Law?, 42 U.C. DAVIS L. REV. 1375, 1402-03 (2009). 25 Phila. Nat’l Bank, 374 U.S, supra note 23, at 362.
the public may demand greater structural mechanisms. 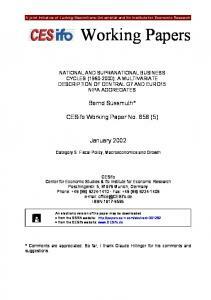 Rather than closely regulate financial institutions deemed too-big-to-fail, policymakers would strive for structural mechanisms, such as limiting the financial institutions’ ability to grow beyond a certain threshold31 or separating “utility” banking from riskier investment banking and trading activities.32 The structural mechanisms would be designed to protect the public from the most ineffectual bureaucrats, while leveling the playing field for smaller financial institutions that do not have the political clout to receive an implicit government guarantee. Third, the public in the next antitrust cycle may demand greater accountability of the antitrust enforcers. With a greater focus on dynamic competition, it would become more difficult for competition officials to allow mega-mergers with light consent decrees (requiring, as in the bank merger wave of the 1990s, large integrated financial institutions to divest relatively few local bank branches in the overlapping narrowly-defined markets). Citizens may demand more predictable, objective, and transparent antitrust enforcement by the agencies. 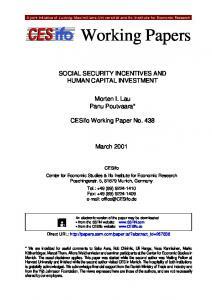 Citizens may also seek to lower the barriers to bring their own private actions. Due to the current high litigation costs and the inherent complexity of competition cases, consumers may demand standards that make it easier to recover for their antitrust injuries. This too would require better legal standards than the current rule of reason. Fourth, as private and public antitrust enforcement grows around the world, the costs from uncertain and inconsistent legal outcomes will likely increase. Multinational firms’ concern over such uncertainty will likewise increase. As the Court’s rule-of-reason standard is an unattractive export, especially to countries with less developed judiciaries, firms will increasingly demand clearer legal standards. Even if the standard imperfectly weighs the costs of false positives and negatives, it will be accepted over an inconsistently applied rule of reason. Thus, in the next antitrust cycle, the legal standards may shift in two ways. 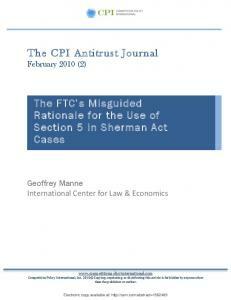 First, as recently signaled in linkLine, the Court may shift from a “case-by-case” approach, which focuses on the “particular facts disclosed by the record”33 to simpler antitrust rules “clear enough for lawyers to explain them to clients.”34 Second, the standards may shift, whenever feasible, from directly regulating market participants’ behavior to maintaining a competitive structure and preserving freedom therein. V. CONCLUSION This Essay maps two possible scenarios in the next U.S. antitrust policy cycle. The first scenario is the status quo. Antitrust’s conception of competition remains confined to the neoclassical world of rational profit-maximizers with willpower. The goal of competition law will be promoting total or consumer economic welfare. With a narrow construction of competition and narrow economic goal, antitrust law will continue to diminish in importance in the United States. With its narrow conception of competition, antitrust policy will 31 Id. at 214 (proposing a cap on financial institutions’ control or ownership interest in assets worth more than a fixed percentage of U.S. GDP). 32 Mervyn King, Governor of the Bank of England, Speech to the Scottish Business Organizations (Oct. 20, 2009), http://www.bankofengland.co.uk/publications/speeches/2009/speech406.pdf 33 Eastman Kodak Co. v. Image Technical Services, Inc., 504 U.S. 451, 467 (1992). 34 Pacific Bell Telephone Co. v. linkLine Communications, Inc., 129 S. Ct. 1109, 1121 (2009) (quoting Town of Concord, Mass. v. Boston Edison Co., 915 F.2d 17, 22 (1st Cir. 1990)). promising indicator of this trend is California v. Safeway, Inc.41 Thus, much depends over the next antitrust cycle on the degree to which the judiciary leaves trade-offs and complexities to the politically accountable legislature, and accepts simpler, albeit imperfect, standards. Finally, it depends on the public’s demand for change and the incentives of policymakers to undertake this analysis. Sound antitrust policy requires steady Congressional oversight and leadership, which diminished during the past antitrust cycle. So if you are unhappy with the status quo, demand for change. Demand that the policymakers do more than reorganize antitrust agencies. Demand that policymakers take into account the new economic findings in assessing first what is competition, second what can competition achieve for us, and finally how can competition promote the good life. 615 F.3d 1171, 1192-93 (9th Cir. 2010). 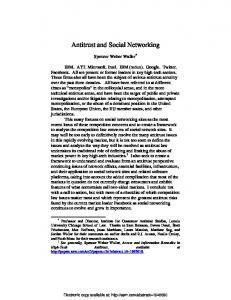 Report "Antitrust 2025 - SSRN papers"